We often find that in molding Generation Z into social and political change agents, it is easy for our voices to be muted or ignored by policymakers, legislators, representatives, or everyday adults turning their noses at the idea that teen advocacy is a plausible way to incite reform. As a self-proclaimed “activist” in only the couple years of my high school experience, I have firsthand known this to be true and recognize it as one of the most debilitating factors in the step-by-step process of a project with a slightly audacious goal, or even in the event that I speak on my passions to figures of authority and can’t help but feel adolescent and ineffectual. When I see someone like 17-year-old Molly Jackson, I see myself—someone with a little bit more hope. Molly Jackson is a rising teenage actress who has starred on shows such as Andi Mack, Nicky, Ricky, Dicky & Dawn, American Vandal, Blaze, and the Monster Machines, among many more. I wanted to use the platform I got from my career to bring attention to different causes that I think are really important in the world. “I’ve always known that I wanted to act,” says Molly, who’s been in the business since she was five years old and fell in love with theatre and the act of telling stories to evoke emotion. She then moved to Los Angeles at eight years old to make acting her long-time career and steadily gained a platform doing what she loved. However, it wasn’t until 2016 when her career picked up traction that her eyes opened to the world of advocacy. “The #MeToo movement was when I really started paying attention, especially after the recent presidential election.” Molly refers to the social movement that took the media by storm, used for women to come together in solidarity against acts of sexual assault and harassment following allegations against Harvey Weinstein. My job is to tell stories. The more aware I can be, the better storyteller I can be. Molly speaks about doubts familiar to any youth advocate, not only in substance but in circumstance. Before you even begin to think about the steps necessary to begin a campaign for an issue or raise awareness on a topic you’re passionate about, you always need to consider how to approach adults. How to present yourself and your issue, who you need to have in support, the words you’re going to use. It can all very easily become intimidating and if you don’t opt out of it altogether, you’ll likely find yourself in a position where you don’t even know where to begin. Molly and I would agree that this is the biggest hurdle, but this teen powerhouse knew that she couldn’t use her platform better in any other way. “I wanted to use the platform I got from my career to bring attention to different causes that I think are really important in the world,” Molly says, and this is exactly what she did. Molly consistently shares updates about her own activism on her Instagram and opportunities her nearly 300,000 followers can get involved with as well. Today I am supporting these peaceful protesters, in handmaid’s attire, and I am asking you to support them too. Contact your senators, and encourage them to oppose Kavanaugh’s confirmation as a Supreme Court Judge. * Call 202-224-3121 * Call 202-684-2473 (goes through PP) * Visit dearsenators.org for more ways. If you care about women’s rights, healthcare, the environment, or gun control then you must take a stand to stop Kavanaugh. If those aren’t good enough reasons for you, then call because you believe in transparency. Stand up for the civil rights of all Americans today. This is a lifelong position, and will affect our generation in detrimental ways. #StopKavanaugh #TakeAction – If you want to read more on the Handmaid’s protest, I attached a link in my bio. It wasn’t until this future humanities major’s career picked up that she decided she was going to use her platform to hone in on women’s rights advocacy and issues pertaining to gun control. She can resonate with both issues, being a young woman who has experienced firsthand institutionalized sexism and fearing for her fourteen-year-old sibling going to school with the possibility of being put in harm’s way. Molly is still in the early stages of her hopefully long career in activism and it seems as though getting involved in smaller organizations is the more impactful way to go. In fact, for her seventeenth birthday in November, she made it her mission to scout local groups to reach out to and endorse in hopes of exposing their efforts to her followers; this is how she became in contact with us here at the Youth Activism Project. As a result of her efforts she was able to inspire others to donate to our cause, and probably created potential change agents in the process! 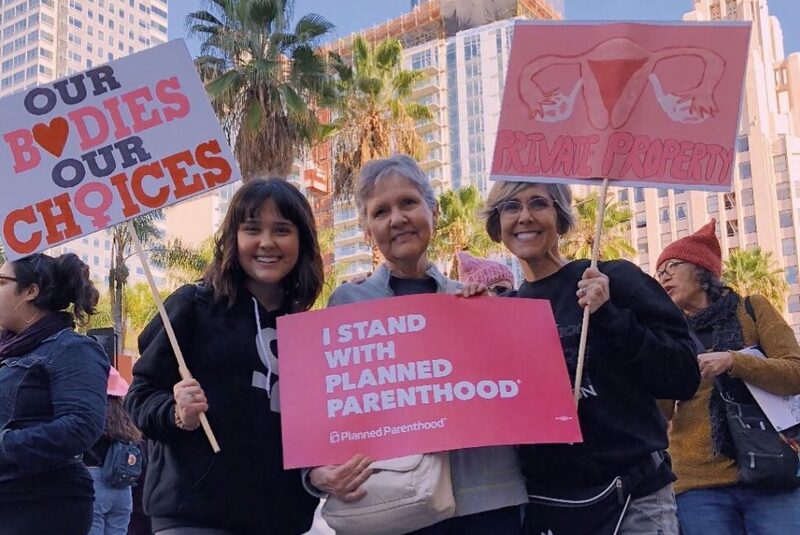 Molly marching with her family in support for reproductive justice, a cause that she is especially passionate about. This may seem simple or trivial especially if you’re new to activism and eager for change, but sometimes it’s not about something necessarily “tangible” or concrete than it is about simply using your voice to spread awareness like Molly does through her social media. In a post following the tragic shooting in a bar in Thousand Oaks, California that claimed twelve lives, she expressed her sadness and shame at politics and humanity in relation to gun violence. She used this to encourage her fellow youth to “demand change” and delve into politics on a local level. Simply by her comments of sympathy and support, she had already done so much to bring attention to an otherwise “quiet” occurrence among the youth that was connected to the very prominent topic of gun violence. I’ve spent a lot of time in Thousands Oaks, and to hear of this happening so close to home creates a new level of real ness. There have only been 311 days in 2018, and 307 shootings. Totally sickened and horrified at the moment. This is enough. We NEED change. Shootings can NOT become our new normal. This is not a party issue, but a human issue. Everyone needs to be on board in order for change to happen. • Get involved in politics on a local level, organize protests, call your representatives, use your platforms, urge your peers to stand with you, and DEMAND CHANGE. We won’t live like this anymore. 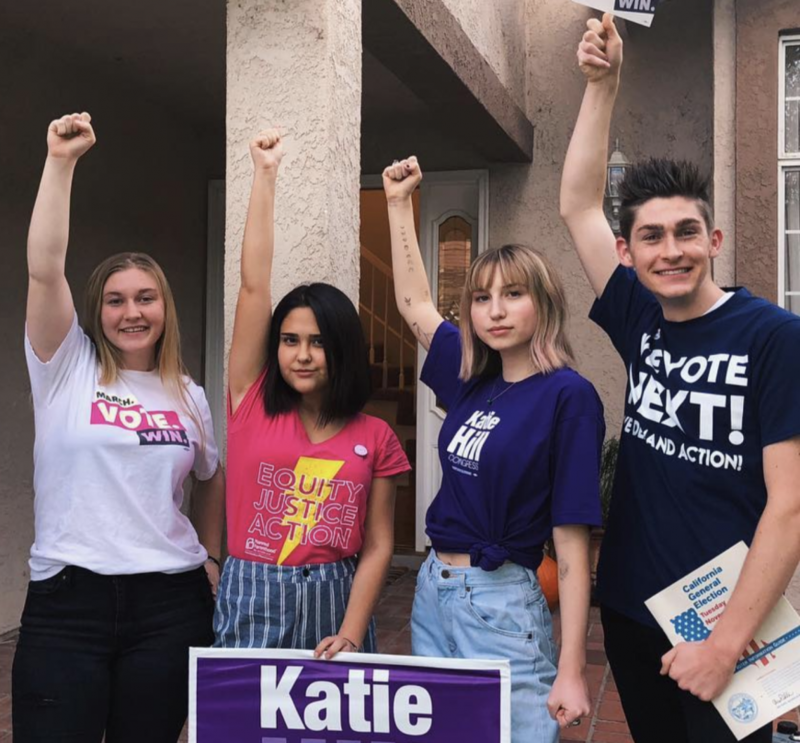 Before even reaching the voting age, actress Molly Jackson has proven how integral she is in our generation taking its first steps to modernizing and correcting the political and social errors of our predecessors, using our voices as the most important tool. She is paving the way for other young activists like me to champion in a world that will soon be run by millions just like ourselves. Lulit Shewan is a college-bound senior at John F Kennedy High School and three-year affiliate with the Youth Activism Project through Youth Uplifting Health (YUH), a team of young activists that focuses on the health and well-being of teens. She is co-president and co-founder of YUH as well as Editor-In-Chief of her school newspaper.